Sunset Lodge - Barra Accommodation. 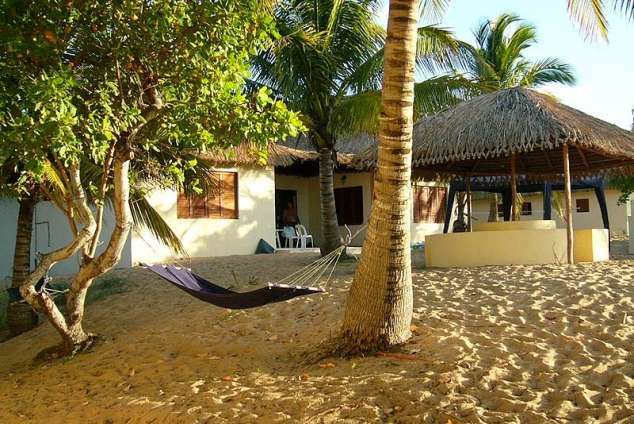 Sunset Lodge is situated approximately 496kms north of Maputo on the Barra Point with mangrove swamps which frame the calm waters of the Inhambane Bay. Barra is well known for its game fishing & boat launching from the beach is smooth & easy. The vast array of unexplored reefs which team with marine life, are perfect for snorkelling or scuba. Sunset Lodge is perfectly positioned to capture the gentle sea breezes which offer a refreshing relief from the balmy summer conditions. The Thirsty Parrot restaurant & bar serves up a variety of hearty meals as well as the most popular cocktails in town. The entertainment area consists of a semi wrap-around swimming pool with bar service directly to those relaxing in the pool (great ringside seats for those must-see sports events) & a large airy restaurant & deck area. This offers an ideal setting to witness the most spectacular sunsets over the bay whilst sipping on an exotic cocktail. Accommodation is offered in cool, tiled chalets with thatched roofs. These 8 to 10 sleeper spacious units are fully equipped for self-catering and comprise 3 to 4 bedrooms, 2 bathrooms (one of which is en-suite), large open plan kitchen/lounge/dining area. Situated approximately 1,5km off the beach on a sand dune, they offer grand views of both beach and bay from their individual patio and braai (barbeque) areas. The "Brick Cottage" which sleeps up to 6 guests is fully equipped for self-catering purposes & consists of 2 bedrooms, shower & toilet, open plan kitchen, lounge & dining area. This unit is cool & airy in the hot summers. It also has its own braai area. Please note that this unit is not situated close to the main units & does not have sea views. The "Fisherman's Cottage" is also situated away from the main units. This quaint unit sleeps 2 guests (2 single beds) It consists of one bedroom, shower, toilet, hand basin, open plan kitchen/lounge area. It is fully equipped for basic self-catering accommodation. Please note that it does not have sea views. Guests are required to bring their own towels, laundry soap & dish washing liquid. Guests are advised to travel in a 4x4 or 2x4 vehicle with diff lock. We do not suggest coming in a car. A raised 4x4 or vehicle with a diff-lock will enable the freedom to explore the beautiful area and to get directly to the lodge without hassle. GPS Co-Ordinates - S23 degrees 47'54.25" E35 degrees 31'09.41"
From Maputo, follow the signs to Xai Xai (EN1). Drive straight through Xai Xai. At Lindela there is a fork in the road. Take the right hand road as continuing straight goes to Maxixie. Drive through the city of Inhambane and follow signboard to Tofo, Barra and the Airport. Continue with this road for approximately 15 minutes until you reach the Barra/Tofo crossroads. With Bar Babalaza on your right hand side, continue straight on tar road for approximately 6 Km. On your right hand side will be a big tree with vendors selling fruit/veg and many signs for various lodges (look for Sunset Lodge sign board on left hand side). Turn right at the signboards (on beach sand road) and veer left just before the top of the hill (another Sunset Lodge sign). Continue on this beach sand road for approximately 500m until you reach the top of the road. Check-in at reception or at the bar if the reception area is unmanned (after hours). Do not drive at night to avoid getting lost..
26251 page views since 17 Mar, 2009.